Published on August 23, 2008 in PHP. 2 Comments Tags: agile, development, PHP, trac, workflow. Trac is a well known issue tracking system with an integrated wiki, version control browser and more. It allows for a more streamlined development process with software tickets, changeset views and roadmaps. An excellent fit for helping with PHP application development, for example. Now, agile development has certainly proven its use in the PHP world, but imho lacks a good tool to track everything that surrounds it. We’re talking about a way to manage user stories, requirements, tasks, time tracking, sprints, product and sprint backlogs, all in a preferably web-accessible way. The only ways I know of before are using Excell or the Phprojekt Scrum addon (which I honestly didn’t try yet, I’m not (yet) familiar with Phprojekt). Some weeks ago though, I stumbled on Agilo for scrum. Agilo for scrum is a Trac plugin that uses the issue tracking system and extends it with features that enable you to follow a more agile development process. It’s still in early beta, but looks very promising already. It’s got an Apache Software License 2.0 so you can always have a look under the open-source hood ;-) Installation is possible with a python egg, so you can easy_install the whole thing, provided you have the needed dependencies (matplotlib and the python imaging library, to name a few). After setup, Trac is modified quite substantially so let’s have an overview. 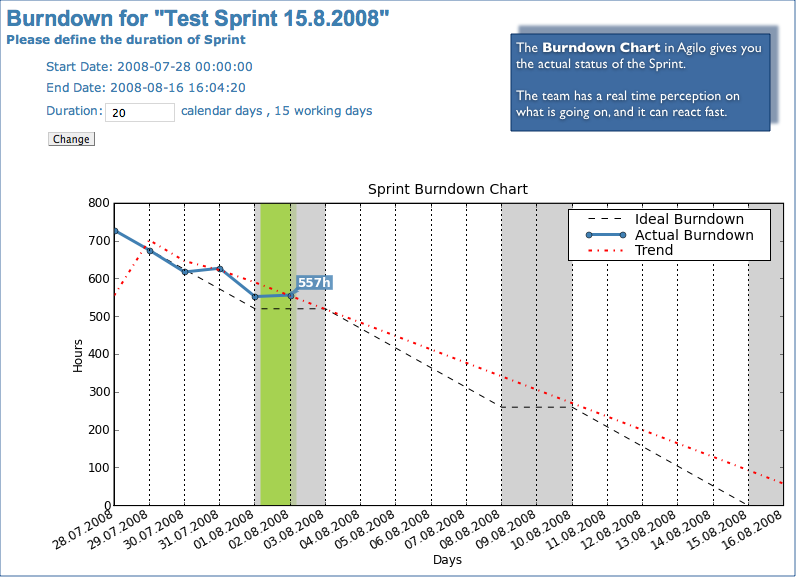 The main change is the new dashboard link, which hosts some nice graphs on the sprint burndown and displays resolved or open tickets. Below the charts, the available actions and reports are displayed. Actions include creating requirements, tasks, user stories or bugs. Reports are for example the product backlog and sprint backlog. The great thing about the changed issue tracking is that it’s now possible to build relations between different registered issues. This way it’s possible to have a user story with different tasks linked to it. Different Trac users can be assigned to development groups and the amount of possible spendable hours can be set on a per-day basis for each developer. This way it’s possible to see how much time something should need and how much developer time there’s still available to implement a feature. It’s a pretty sweet enhancement to Trac, and although it isn’t totally ready for production use (yet), it’s worth to have a look and test it out, you might like it! More information can be found on the agile42 website.